A view from the cycle path: Do people cycle in the Netherlands because it's difficult to drive here ? Do people cycle in the Netherlands because it's difficult to drive here ? Researchers at IBM have come up with an index for how bad it is to commute by car in various cities in the world. For a long time I've argued that the Netherlands wins cyclists mostly by making cycling pleasant. Use of the carrot rather than a stick. It's much better to convince people to do something because they want to do it than to force them to do something they don't want to do. And that's how it is here. There is no "them vs. us" feeling around cycling vs. driving. Most people both cycle and drive. Of all the cities in the survey, Amsterdam has easily the highest cycling rate. It has been shown that increasing the proportion of journeys by bike has many benefits, amongst them improving conditions for the remaining drivers. This is born out by this research which reveals that not only is Amsterdam good for cyclists, but it is also a better city for drivers than car oriented cities such as London, Madrid and Paris. 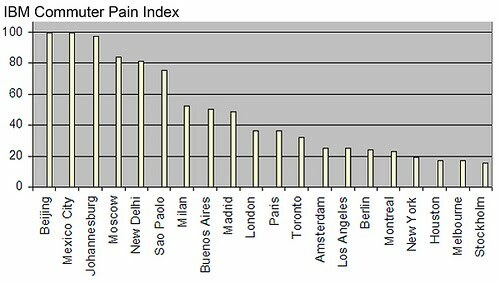 For drivers, Amsterdam is on a par with Los Angeles and only very slightly worse than Berlin, Montreal, New York and Melbourne. The worst place in the survey for cycling is Beijing, a city where driving is rising as fast as cycling is falling. Roads in the Netherlands are actually very good. They're an efficient network, well maintained. They are also well sign-posted and car parking is not difficult to find. It's an easy place to drive. However, despite this, car ownership is actually relatively low for such a wealthy nation. People cycle here because they feel that they can. Cycling is attractive, convenient and safe. Why doesn't everywhere try to emulate the Dutch success in cycling ? It really is difficult to find an excuse which holds water. Even the world's best cycling infrastructure is not actually expensive. It's quite possibly the most cost effective method for improving conditions for drivers. The IBM link came via Velo Mondial. london is trying to improve its cycle paths with blue lanes.it is having difficulties. i dont think it is money, but lack of space. the roads are narrow and the houses and shops are built right up to the roads, with no extra space next to the roads for bike lanes. i have suggested making some roads bikes only, but those people living along those roads wont like it, because they wont be able to park right outside their houses. and there is no way anyone is going to agree to bulldoze the houses to create more space for bike lanes. any suggestions how to create the space for the bike lanes? Anthony, London's "superhighways" are quite exceptionally awful. However, London suffers no more from a lack of space than any other city. Many Dutch cities are also old, and faced the same difficulties. I have some before and after photos which show the sort of thing that has happened in every city here, and could also happen in London. There are also plenty of roads in London which have multiple lanes for motoring. In many cases, removing one lane, or re-arranging car parking, would be enough to provide a proper segregated cycle path. On road cycle lanes are not what is needed to result in mass cycling in London, or anywhere else. The IBM study is slightly misleading though. The index is a black box of many indicators. Amsterdam has the worst commuting time of all European cities with 31,5 minutes! 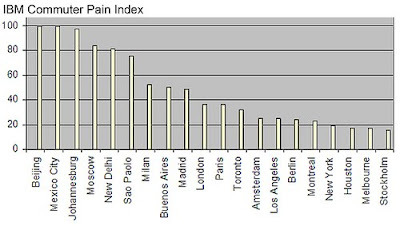 However, because the Amsterdam people do not complain too much about it, the index score gets slightly better. "i dont think it is money, but lack of space. the roads are narrow and the houses and shops are built right up to the roads, with no extra space next to the roads for bike lanes." I'm sorry but this really doesn't hold water. Central London actually has incredibly wide roads, all over it. Where I live in Outer London the roads are narrower but the space for segregated cycling infrastructure on the Dutch model very definitely exists. The first problem in London is that the majority of cycling campaigners show little or no interest in what the Netherlands and Denmark have achieved. They are locked into 'vehicular cycling'. If there is no vision among cycling campaign groups, it's no surprise that there's none at all among traffic planners, who are predominantly able-bodied male car drivers who enjoy a subsidised car dependent lifestyle. The second big problem is that the road space which exists for cycling infrastructure is often currently dedicated to car parking. Getting rid of the cars will be a political challenge but this seems to be what happened in Copenhagen (from below) and in Groningen (from above, in the form of enlightened traffic planners). Unfortunately where I live car dependency is promoted and encouraged in every aspect of the road network. Bus users, cyclists and pedestrians are all seriously inconvenienced by the priority given to the individual who chooses to use a gas-guzzling 4X4 to drive short distances in a dense urban environment. London doesn't have a single road where the cyclist has primacy over the motorist. It's absurd and grotesque that six-lane highways like the Euston Road don't even have a cycle lane, let alone separated cycle paths on the Dutch template. Closing off whole roads to traffic, with no exemptions, is certainly part of the solution. This study is done by IBM and it pretends to deal with commuter problems. In fact it deals with CAR commuters and its only aim is to promote sophisticated car commuting optimization by IBMs computer systems, not to focus on optimization of commuting in general. I'm surprised Montreal ranks as high as they do for good driving. As for excuses? I've heard them all. From Canada being too cold (including Vancouver which hardly goes below 0), to an ageing population. In a span of four months, I've heard the term "biking age" thrown around. People claiming that those who are essentially 55 and older simply can not ride a bike therefore we should be adding more car lanes. When polls are conducted as to why more people don't cycle, they site a lack of safe bike lanes. When cities think of putting them in, usually the same people complain that a lane or two for cars is being taken away. I'd say for Canada (and the US) it boils down to culture. Cars are good, bikes are for kids. It's a shame we can't be more like Germany which has a culture of cars, yet still has respect for bicycles. Marco: I know where you're coming from, but driving in NL really isn't difficult, unless you make the mistake of trying to go through a residential area. A 31.5 minute commute is really not that long. The world average is 40 minutes each way and many people in the US commute for much longer than that. The average US one-way commute time is 26 minutes over an average distance of 16 miles - a cyclable distance. And according to the same link, the worst days have an average of 46 minutes over the same distance - a speed which can be done by bike with greater consistency. Michael S: You're right that they appear to be completely fixated on cars in the study. I don't think they mention bicycles once, even though they are such a part of the picture in Amsterdam. Ryan: As you know, people continue to cycle all through winter here. It's too cold is a classic excuse. And yes, the Dutch also continue into old age. I've got an absolute corker of a post coming up on the subject of elderly cyclists, but for now you'll have to make do with these. I think it's ironic to see Los Angeles and Amsterdam achieve the same score here. Motoring fundamentalists often complain that Amsterdam is so car-unfriendly, or that it's conducting a "war on motorists". Congestion, car free zones and high hourly rates for parking are usually cited. Los Angeles on the other hand, is supposed to be the walhalla for cars, a place where anything and everything must bow to the needs of the automobile. People get into their cars to cross the street in LA. Nobody walks or cycles anywhere. Trains are for people who are afraid of flying and busses are for hobo's and the mentally ill. Yet for all the pampering and the millions of dollars invested in car use, the commuting experience is apparently equal to that of Amsterdam, where cycling is given a higher priority. Personally, I don't think that's a coincidence. Your broken record comments on the value of cycle paths as the one true path to cycling utopia unfortunately obscures the very real and intensive programme of 'mobility management' which the Dutch have practised over the last 40 years. Clearly good cycle tracks get people cycling, and the Dutch build the best ones in the world - thanks for illustrating them. Yet it isn't the only way these things work, and designing motor vehicles out of towns is critical to this. You basically admit this in your comments when you say driving is easy: "unless you make the mistake of trying to go through a residential area." (ie, 85% of most urban areas) and, in your second comment, pointing out your blog post outlining how Assen managed to almost completely eradicate the car from the town centre, presumably through restrictions on motor traffic. Internally inconsistent blog post, and not the first from you. Jim: I think you're misunderstanding what is meant by the restrictions on residential areas. As I only know your first name and don't know where you are from, it's difficult to know what would be a good example for you. However, residential roads here are very different from the equivalent roads in the UK, for example. Rat-running is a very rare phenomena in the Netherlands. Residential roads really don't provide good through routes for drivers, whether they were designed not to or whether this was retrofitted. And yes, town centres are generally not all about cars. These have been changed not only here in Assen, but in all city centres. Groningen is another good example. However, even when you have done these things, and civilized many residential and city centre streets, cycle paths segregated from motor vehicles remain absolutely fundamental. That's why there are roughly a quarter as many km of segregated cycle paths in the Netherlands as there are of roads and why building more of them is still such a high priority. There are over 29000 km of cycle paths - not counting substandard recreational only paths in the countryside, about 136000 km of road, and also about 5000 km of on road cycle lane. I'm really not sure where you think there is an inconsistency. However, you seem rather upset by this post. If you don't like what I write, you don't have to read it. David; we do have a fair amount of people who cycle in the winter as well as a great number of elderly who ride. Usually those excuses of "too cold" or "too old" are the same people who will find any possible reason not to cycle, more often than not out of laziness. I look forward to your future post on elderly cyclists. I think 'Jim' is spotting a contradiction where none exists. I would love to see genuine car-free zones in Britain. I also think mass cycling is only ever going to develop if Britain starts building the kind of segregated cycle paths that the Dutch enjoy. Politically it's easier, I think, to start with the cycling infrastructure. Although it would be nice to see some roads in central London designated as car free. The problem in Britain is that we are being offered everything except good quality cycling infrastructure. I find the comments in response pretty interesting. When I see the pictures and video of David on his routes, be it separated or in downtown areas, the cars seem to be moving along just fine. Yes maybe they wait a bit more at lights, or drive slower in many areas, but I don't see that as a problem. It is not so much anti-car as a policy, it is smart transportation planning. That policy of best fit(it seems) means that in some areas cars are disallowed due to the use of the area and the best transportation option (foot and bike) The Netherlands still has fast roads, highways and access to most areas for people in a car. But it also provides the same for cyclists and for mass transit (I presume). That is the key here. In the US the culture is that if you are not with us you are against us and that is not quite correct. Just because I personally do not like cars, and prefer bikes does not mean I am going to segregate everything so cars are not able to access the areas that it makes sense for cars to access. I am not against cars (OK I am personally, due to their misuse as a form of transportation) I see their uses for many things and see the need for that type of personal mobility. However we need to be thinking about choice. In a way it is against cars since there is limited funding for even roadway repair( although that does not seem to stop new highways and expanding bridges from 4 to 8 lanes...) However as it seems a bicycle, if provided for, means road capacity can be significantly increased as drivers get on their bikes because it is more convenient, that means that road expansion is not needed and as wear and tear is reduced constant upkeep is also reduced. It is much cheaper to build a bicycle path to accommodate 1000 bicycle and hour than 1000 cars an hour. If bicycling is seen as normal and done where possible and where easy then the people that need a car or need to make deliveries have an easier time of navigating their space. The idea that this is a war on cars or that we are anti-car needs to be debunked. The policies that are best for all are anti-car in some ways, true, residential slow zones, pedestrian centers, narrowed car lanes, removal of on street parking, but that is a consequence that car facilities do not provide the best use of space and resources for the community, not that we are anti-car per-say. We need to re-frame the debate such that the anti-car argument is instead thought of as a pro-community, pro-accessibility, pro-mobility, and pro-business argument because in truth that is exactly what it is. I very much agree that driving is also very pleasant in Holland -- I was very surprised how "boring" it was to drive from Leeuwarden (the northern edge of the country) to Delft in some two hours. Traffic is very good here -- the fact that drivers actually obey the speed limit (and the dozens of inventions of traffic engineers) means that highway flow is very continuous here. Now of course on a workday morning or evening, highways are very congested, but that is what you deserve when you try to drive to work 5 times a week, I tend to think.